Whilst I don’t class myself as an Apple fan-boy I do buy into their platform heavily, mainly due to the fact that I have been burned so many times as an early adopter that I just wanted a phone that not only worked, but that did what it said on the packet, but was reliable. Apple’s products work flawlessly (although not always cutting edge). I decided late last year that I would buy into the Apple HomeKit eco-system mainly due to having iPads, iPhones, Apple Watch and a 4th Gen Apple TV (that acts as a hub and bridge to the control devices external to the house). Just as Santa was delivering my first shiny and pristine HomeKit compartmental smart socket and a Philips Hue Starter Kit a relative purchased the Amazon Echo. I am not ashamed to say it laid in it’s box for a week whilst I was playing with the HomeKit compatible devices. Then I finally got round to tinkering with the Echo…. what fun! The playing of music (never got round to having a sound system in the kitchen) and controlling of lights is by far the most used features of the Echo and I am surprised at how capable it is at hearing and understanding commands from over 30ft away whilst the TV is on and the kids and making a noise. We can easily control lighting from the lounge even though their is the dining room between us and the Echo. The Echo is constantly having small upgrades, early on in the year you had to use the IFTTT service to turn on a predetermined colour for Hue lamps, now Alexa can do it seamlessly on her own and you can request colours without presetting. Addition of “Skills” (think of as an app for your Echo) allows for integration with other devices such as Plex Media Server where I can ask “Alexa, Ask Plex to play Spongebob the Movie”, a go-to-kid-pleaser! Now admittedly we lag behind the US for features (but as ever they work extremely well when they come over to this side of the pond). 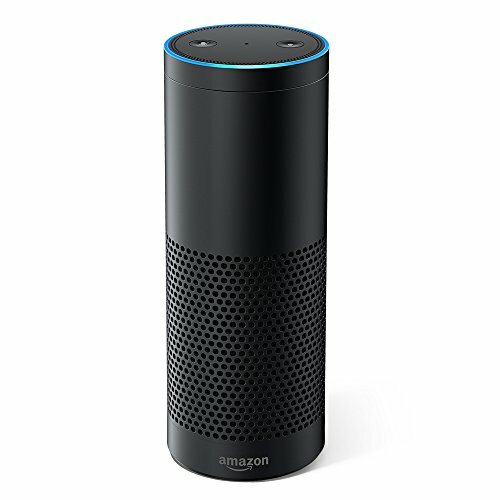 But such features as being able to play the same music multi room synchronicity, texting of voice calling your Echo for reminders and two way comms between internal and external devices are sure to keep the platform fresh and innovative, as well as giving the rival a real run for their money. I am not afraid to say that it is favoured over using the Siri button on the TV remote or lifting my apple watch for a Siri command – it’s already listening for me and is quicker to react – just as long as I am in ‘ear-shot’ and other family members are not being disruptive (my eldest loves to either beat me to a request, confuse Alexa or countermand me – much to his own amusement). In relation to learning they show a level of interaction that can be a real advantage to learners (although I don’t fancy taking mine into work just yet! ), an always attentive support assistant that can help with definitions of terms, perform calculations, set timers for activities, set reminders, read audiobooks, play music (or audio files), request spelling of word, synonyms and even translate phrases into other languages. These are available right now so who knows what the future might bring? For a device that’s been available in the UK since the 28th of September 2016 that was fun from the start and has constantly evolved I would recommend a purchase, definitely as a solid entry in home automation and the fact they are heavily discounted on occasion and can be over 30% off. Would I buy another? I can’t see why not, I am just holding out for the expected V2 rumoured to launched later in the year to compete with the impending Apple HomeHub. With improved Audio and styling. Do you have an Echo or Dot? What do you use your for?